We will remember them is the title of a book written by SMA Fr Peter McCawille. It is a timely memoir of the early SMA, other missionaries and diocesan clergy and religious who worked in what was known in the past as MidWest Nigeria. Today it covers Bayelsa, Delta and Edo states in the 36 State Federal Republic of Nigeria. It covers the period from the death of the first missionary in 1884 until 2011. The book will be officially launched on St Patrick’s Day – 17 March 2012 – in St Andrew’s Catholic Church, Ugbighoko, Benin City, Nigeria following a Mass at 10am. Leading the Organising Committee is Nigerian-born Fr Augustine Onwuzurike SMA who responded to a call from the Archbishop of Benin City to return to the Archdiocese and re-establish the SMA presence there. The last SMA priests to work in Benin City itself were Frs Willie Cusack and Brian O’Kane. They left St Theresa’s parish in 1985. 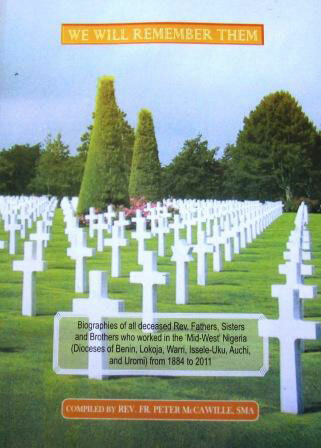 Fr Richard Wall was the last SMA to leave the Archdiocese of Benin City though not by choice! The Holy Father created the diocese of Uromi from Benin City and Fr Wall was working in the new diocese at the time of its creation. He readily agreed to stay on in his parish. And there he remains, in his 56th year as a missionary in the MidWest of Nigeria. At the time of their ‘return’ St Andrew’s was an outstation of the Parish of St Francis, where V Rev Fr Alex Nzemeka is the Parish Priest. With a long association with the SMA, Dr Nzemeka, who was Professor of History in the University of Benin for many years, welcomed the SMA back on Palm Sunday 2009. Since then, steady work with the people has seen St Andrew’s develop into the vibrant parish it is today. Though still to complete the Parish Church the parishioners have worked tirelessly to ensure that Saturday’s celebration will be held in as fitting a setting as possible and that it will be a memorable day for all concerned. Fr Peter is the Director of the Family Vocations Movement in this part of Nigeria. His work brings him into contact with parishes throughout the Archdiocese and beyond, as he seeks financial aid and prayers for the growing body of Nigerian SMA seminarians and priests. And both are essential and intertwined. We must pray for Vocations to the priesthood and religious life. But we must also educate and care for the seminarians who respond. And after their Ordination as SMA priests, we must pray that they will be faithful missionaries. In Nigeria they say: ‘man must wack’ it means that every person must eat! And so the Society seeks funds to help our priests to live and do their work. Though most of the money needed still comes from Ireland, a steadily growing amount is coming from within Nigeria as its people take on the responsibility for evangelization, more and more. When the first SMA priests arrived, in 1882, little did they realise that the area confided to them would today embrace several dioceses. And so to honour that growth, priests, religious and laity from all over the Benin City Ecclesiastical Province and beyond, will be there to add their prayers in thanks for the work carried out by their fathers and mothers in the faith. They will travel from places such as Lokoja, Warri, Uromi, Bomadi, Auchi, Issele-Uku, names which will echo in the heart of every SMA who paid attention at SMA History classes in the seminary! The Irish Province will be represented at the celebrations by Fr Bernard Cotter who worked for many years in the north of Nigeria. With a total of thirty-five years in Africa Fr Cotter will have many memories to recall as he visits some of the places where the missionaries are buried. The 330 page book is printed by OLREC Graphics & Prints, Ibadan, Nigeria. It relates the stories of nine Congregations of Sisters, ten different Societies of priests as well as priests from six dioceses in Nigeria. Further details and where to obtain copies here.